It seems like every week there is a new e-mag popping up. The ones I've seen all look pretty fab, and I love the idea of people taking the initiative to self-publish an online magazine. 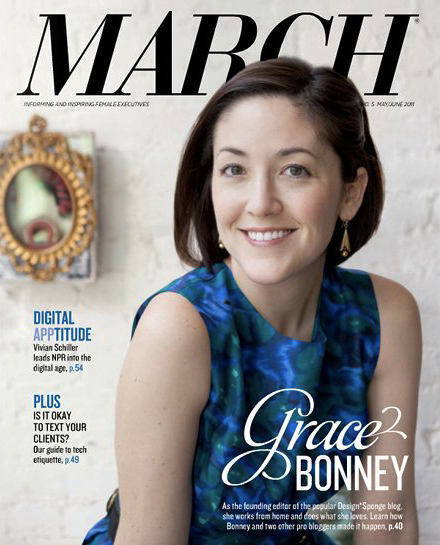 March is a new-to-me e-mag that features Grace from Design*Sponge on the front of the current issue. I read about March on Design*Sponge and thought it was worth taking a look as it stands apart from all the interiors-focussed titles. There are articles about Grace and other professional bloggers and well as features on many other women running successful businesses. I haven't read all of March yet, but at a glance it looks like the content is very inspirational and definitely worth checking out. The current issue features "technology-inspired but not jargon-embedded stories", like Grace's success with 'new' media and technology. I hope you're week's going along nicely... here we are at Wednesday already! Apologies for my absence this week - I'm madly working away here. Oh and pop over and take a look at Grace's new blog design if you haven't already. It's understated and gorgeous.